Hello again, my blog readers! I might go with this feeling: What the hell.... I have graduated already?!! Time flies so fast, people. Growing up, playing hide and seek at the backyard, attending class, finishing school, entering university, attending lectures, finishing the last final exam, writing thesis, and heyyyy, suddenly I have graduated already!? What? Again. Whaaat? Haha! Yes, now I officially have my Bachelor's degree (Bachelor of Economics). I have graduated on Friday, August the 2nd, 2013 with an A mark. Since my first semester in Unpad, I have tried (as possible as I can) to baIance my academic and non-academic life, and I think the result is more than enough for me. I received a cumlaude title and surprisingly I was awarded as the student with the highest GPA in Department of Economics for this graduation period. Woohoo! Hooray for that! (Happy dance. Haha!). My supervisor was Ibu Alfiah meanwhile my examiners were Bapak Ekki Syamsulhakim and Bapak Heriyaldi. It's really my honor to be supervised and examined by those distinguished and respected lecturers. They are all really kind, inspiring, and open-minded lecturers. I really owe my deepest gratitude to them (Also to all lecturers at Department of Economics). May Allah repay their kindness with something better than what they have given me. Ameen. It was very challenging in writing my thesis since it was written in English. My thesis was about the determinants of urban household poverty in Indonesia. 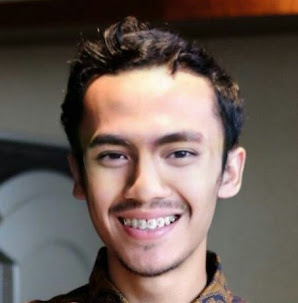 The main idea of my research's findings was that there are several significant determinants of urban household poverty in Indonesia, which are gender of household head, education level attained by the household head, household size, number of working household member, and participation in accessing fund from microfinance institution. See, according to these findings, education really does matter. This finding strengthens my understanding about the importance of education. Study well, learn genuinely as much as you can, put your heart on it, use your time during your study at school/university wisely, add a little bit discipline, pour some passion, and be the best of yourself all the time. If you do what I mentioned earlier, there will be a smaller probability for you to fall into poverty. Now let's take a look at my picture below. 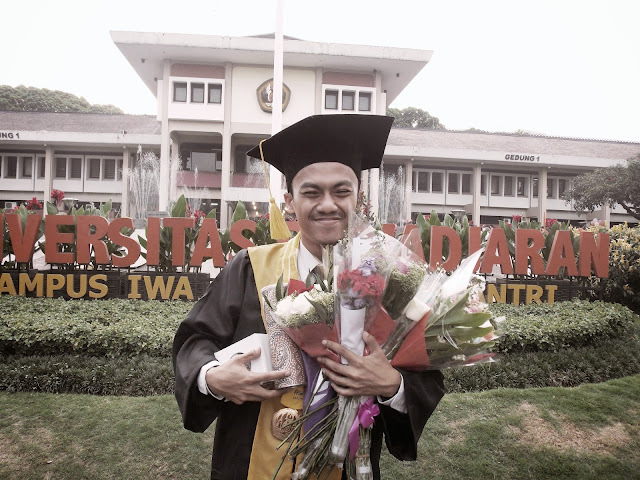 It was taken after my Graduation Ceremony on November 6th, 2013 (4 months after I have my bachelor degree. Oh well, worth waiting, right? Haha). I was very very very happy during and after the Graduation Ceremony, fellas. 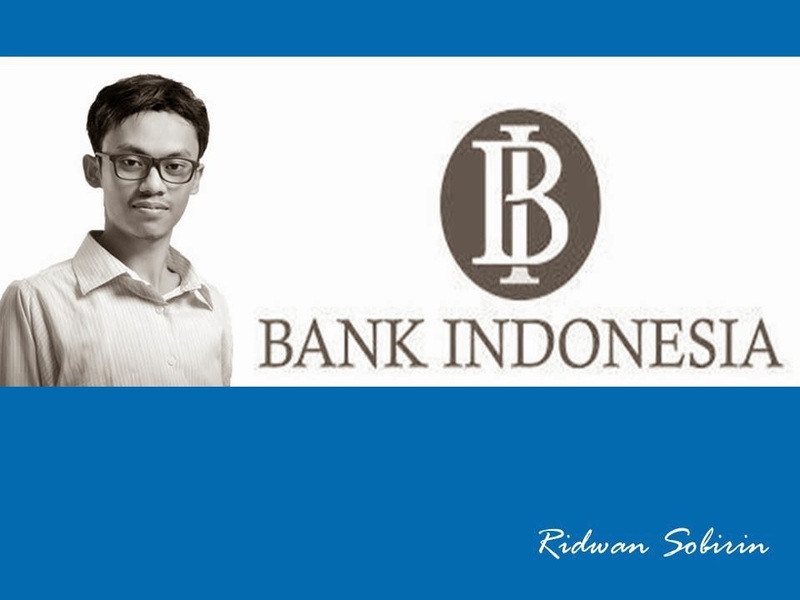 So, Alhamdulillah, thanks be to Allah, on December 31, I was announced that I passed all those rigorous selection processes and have now officially become part within Bank Indonesia (The Central Bank of The Republic of Indonesia). It was the longest selection process that I have ever experienced. It was consisted of 10 selection processes in details and took 6 months (One semester) till the announcement of the final result (July-December). In this selection process, I needed to compete with more than other 60.000 applicants from all across Indonesia. But again, my dream comes true, fellas! Our hard work, prayer, and khusnudzan to Allah paid off. I am also pretty sure that I couldn't have done it alone. Without sincere supports and prayers from my family, relatives, lecturers, teachers and friends, I think I can't go until this far. Now I am going to enter a new stage of my life, a new stage of learning, fellas (That's why the title of this post is New Stage of Learning). Sure, I still have to learn a lot in the working life. I will always try to improve myself. New opportunities and all we need are already there, my dear fellas. That's why now I really encourage you to give permission to yourself to dream big (again)! Be brave, more focus, more discipline to yourself! Yes, your dream or whatever you call it is already there. So, what if you strengthen it with your positive mind, prayers, and the courage of your best efforts. Put much faith in it and tons of hard work to make those dream come true. The result will be somehow more than you ask. Your friends, relatives, or even someone you meet on the street can also be your gate towards your dream and opportunities. So, treat people around you well, too. We are educated and reminded to treat other people well. In Islam, we always call it as Hablumminannas. Also: That beautiful word called "Prayer". You know, I am probably not that really religious person, but sure I believe that Allah is the one who knows the best for our future. Stay sholeh and sholehah. It will ease your way. Believe me (Even though I am still far away from being sholeh title. Really). Life is not always okay. You already realize that unarguable fact. I really realize that sometimes, we have to deal with pain, failure, and disappointment. But that's life. Can you grow without experiencing pain? Can you gain lesson without feeling disappointment? Or can you feel your winning-pride without hard work and super tired try? NO. I have also experienced pain, disappointment, and failure. With that pain, failure, and disappointment you will achieve new stage of understanding. New lesson learned, new experience achieved, and probably a new better personality/perspective appears. Please don't compare your life to other's. DON'T. Don't compare since we don't know exactly what other people have been through. Probably they are success because of their super hard work, perseverance, and strong prayer. And yes, don't forget that you also have your own success and unique stories. What we can do with them is taking some lessons from their experience, from their life. Don't just settle. Don't procrastinate. Don't waste your time and talent. Your study time at Unpad or wherever it is should be used well. Don't just study and settle. Don't just focus on your organizational stuffs. Don't just play around or hang out. Life at campus is all about making them balance. Getting a good grade is a must. Actively involved in some organizations and their activities are extremely important. Having a good friends is also essential. If it's not enough, I will definitely encourage you to go outside, join some competitions, do volunteer activities, or build your own business. That's not impossible, guys. Come on! But remember, you need to really make it balance and reachable. Still, you have to be responsible for your study. I believe every single day, Allah always gives us a handful of surprises. We have learned that life has many sweetness and bitterness, its ups and downs. Life can be very happy, but sometimes life is not always okay, right? But it's okay. It's just for awhile, fellas. Your hard work, perseverance, prayers, and blessing from Allah and your family/friends will do bring miracles. Here, I just want to remind you (and myself as well) about your amanah to give back. All of those high and big achievements/recognition/positions or privileges you have achieved are not only for your personal benefit, but it is also for others benefit. Yes, it's also about the responsibility you carry to give back to others and environment in any possible ways. You should never give up if you want to achieve something. With Allah, everything is possible, my dear fellas. It is a really nice posting Ridwan and I am happy for your new career. Congratulation on the job! Hello Rizqi. It has been ages since our last moment in Japan. Ahahahaha, you're right! My 'You knows" style seems like becoming my identity. Uh! Haha. Glad to know that you are doing fine in Jakarta. Jakarta, eh? Well, I won't give up on its traffic jam and high temperature. Haha. Best wishes for your career and future endeavor, Qi! Let's meet up with other SUSIers in Jakarta, soon!